Plains, Georgia…In the land of presidential peanut farmers, I found myself to be the only full-blooded Filipino in the room at Maranatha Baptist Church, the spiritual home base for No. 39, President Jimmy Carter. And when the president looked into the pews and asked from where people hailed, I proudly declared, “California,” where the most Asian Americans live. 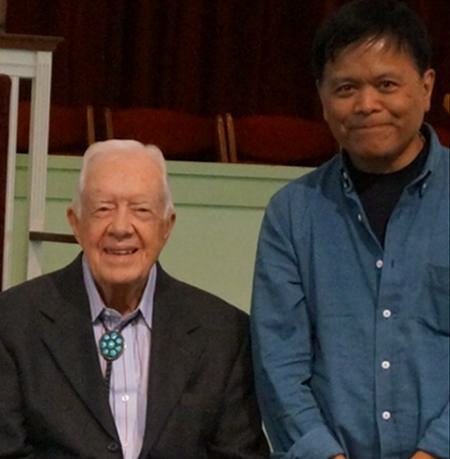 President Carter looked fine on Sunday in Plains. But especially fine for his job on that day– Sunday school teacher on the 15th anniversary of 9/11. Carter, you’ll recall, made headlines about a year ago when he disclosed having both brain and liver cancer and thought he had just two or three weeks to live. After treatments, Carter’s forecast turned out not to be true. This past weekend, the second oldest living president, 111 days younger than President George H.W. Bush, seemed spry and quick-witted as he began his talk with an update. Carter said he’d just returned from San Francisco where he had “supper” with wealthy tech giants, including the widow of Steve Jobs, Laurene Jobs, as well as the first Asian American power couple of the world, Facebook’s Mark Zuckerberg and Priscilla Chan. “She’s Chinese,” Carter said to his 99 percent white audience. And then he said how the Facebook couple planned to give away 99 percent of their $50 billion fortune to charity. “Only gives them $500 million for personal expenses,” Carter joked, drawing a big laugh from the crowd. 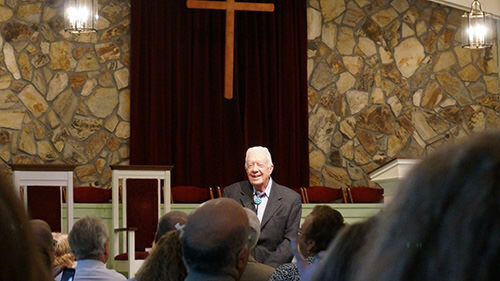 It was just the warm-up for his Sunday school talk, something Carter started this month at Maranatha and intends to continue through November. Sunday, coincidentally, was also National Grandparents Day, and it was hard not to see the former president, wearing a bolo string tie anchored by an eight-stone turquoise clasp that dangled below the neck, as the nation’s grandpa. Carter began his lesson’s general theme on dealing with grief by mentioning his tough year that included not only his health news, but the death of his 28-year old grandson. Drawing from scripture (on this particular day, a passage on the persecution of the Thessalonians), Carter said such moments of grief were simply tests of one’s faith, endurance, and hope. He said overcoming all that was a matter of self-confidence and relying on our god-given talents, but that it was difficult in all phases of life. And then he applied the lesson to the historic day of 9/11. We’re diminished as a country, and our goals for our nation’s future are set too low. Too much has changed, he said. Carter, whose administration took us out of an energy crisis, also pointed out how the U.S. is still suffering from a financial crisis that has exposed a deep inequality that has divided us as a people. 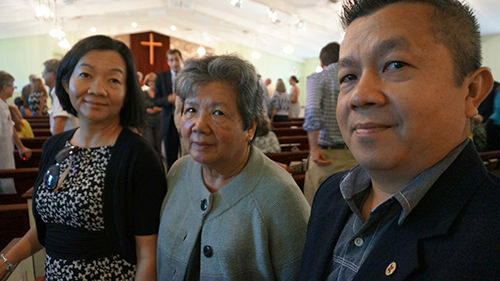 In the pews, along with my mixed-race family (Asian, white, Latino), was another Asian American family, Tim Phan and his three-generation family of Vietnamese Americans. Phan, a computer engineer with the Air Force, came as a refugee with his sister, Heidi Phan, and his mother, Ha Ly. The native of South Vietnam was with her four grandsons, natives of the American South. Jimmy Carter’s sense of America and the world requires open minds to come together. Too often these days, that seems near impossible. Carter’s complaints spread to politics, in general. Carter’s Sunday School lecture was turning into a mini-State of the Union address. “We’ve had a deterioration in the quality of life and the relationship between different people that now has become almost acceptable,” said Carter, who added the nation had changed so much it would be near impossible for the current Republican and Democratic candidates to declare their top priority to live in peace or to promote human rights. Of course, in Sunday School, you know how all that can easily be found again. As Carter ended his lesson, the service with all the hymns and the doxology began. And the promise was simple. Stay and pray, get the photo op. So this suddenly Filipino Baptist praised and was justly rewarded. Clinton will be 69, October 26. Carter will be 92, October 1. (I’ll be another year older on October 9, but I’m not running for or from anything). Having watched Carter, the surviving cancer patient, take charge all morning, I hadn’t been as concerned for Hillary at first. But now that we know she was diagnosed last week with pneumonia, we have a new campaign issue. I’ve had pneumonia in the past. It was one of the worst bouts of sickness I’ve ever had. For me it was like a 10x flu, accompanied with a sharp pain that felt like your favorite Major Leaguer had just applied the sweet-spot of a Louisville Slugger to your ribcage. Clinton shouldn’t be campaigning until she’s well. And that could make pneumonia the pre-October September surprise. It doesn’t disqualify her from running. But a president’s health should only be a concern when he is in his 90s and out of office. Not when he’s trying to make a critical decision. It also means Trump won’t be able merely to go on Dr.Oz’s show to get a clean bill of health. Mr. Non-Transparent will have to come clean about his health and his taxes. In the meantime, Clinton surrogates will have to battle the sickness that is Trump. Tim Kaine, your real life pre-veep close-up has arrived. It was somehow fitting to find myself so deep in the South, I could drive down the road, count to ten, and not see a Waffle House. I was so far south, seeing Jimmy Carter as a civilian/reporter made perfect sense on 9/11.I always dread that day, our national day of mourning, when the shock that has faded comes back in new and different ways without benefit of a Lee Greenwood song. But it also brings back memories of the closest we’ve ever felt as a nation. We were all on the same team on those extraordinary days after 9/11. Fifteen years later, before a critical presidential election, no one likes anyone running, nor does it seem that anyone likes anyone other than their spiritual and political clone. Fifteen years later, before a critical presidential election, this is the time we need the kind of unity we felt after the rubble of 2001more than ever. When I visited Ground Zero in 2013, I stood by the memorial waterfalls there and picked out a particularly diverse section of names. Hogan. Johnson. A Jose, a Kip. And a Chin Sun Pak Wells. Sunny Wells, as she was called by her friends, was born in Tongduchun, Korea, but her family moved to Lawton, Oklahoma when she was a child. She was on the honor roll in high school, worked for a few years at Wal-Mart, then joined the Army. After a tour of duty in Korea, she wound up an administrative assistant to the Deputy Chief of Staff for Personnel at the Pentagon. But she knew she wanted to study medicine in her life after the military. So as 9/11 turns 15 this week, a teenage milestone, we recall how the honor society teen Chin Sun Pak Wells might have been Dr. Sunny Wells. On Tuesday, September 13, Sunny Wells would have completed a Jimmy Carter-esque 39th year and celebrated her 40th birthday, if only for that other momentous day in September, 9/11. Post-9/11, her memory may help lead us to a sunnier America.